Shop online for 13 skywave plastic models at discounts up to 50%. Parts/Acc. is the most popular of the 3 skywave plastic models categories, then Airplanes, and Ships. This is the 1/700 Scale Equipment Set for Japanese WWII Navy Ships (VI) from Skywave Models. This is the 1/700 Scale IJN Multiple Torpedo Tubes Mounted Cruiser OHI from Skywave Models. 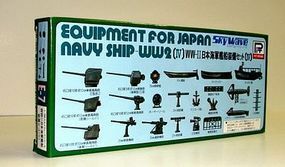 This is the 1/700 Scale Equipment Set for Japanese WWII Navy Ships (I) (armaments, acc, etc) from Skywave Models. This is the 1/700 Scale USN Aircraft Set #6 Plastic Model Airplane Kit by Skywave Models. This is the 1/700 Scale Equipment Set for Japanese WWII Navy Ships (III) (guns, antennas, rangefinders, etc) from Skywave Models. This is the 1/700 Scale Equipment Set for Japanese WWII Navy Ships (IV) from Skywave Models. This is the 1/700 Scale Equipment Set for Japanese WWII Navy Ships (II) (auxiliary boats, davits, etc) from Skywave Models. This is the 1/700 Scale JMSDF Aircraft Set Plastic Model Airplane Kit by Skywave Models. This is the 1/700 Scale Conversion Parts for Japanese WWII Navy Merchant Ships Plastic Model Ship Accessory by Skywave Models. This is the 1/700 Scale Equipment for Small Japanese Vessels (depth chargers, antennas, guns, aircraft, etc) Plastic Model Ship Accessory by Skywave Models. 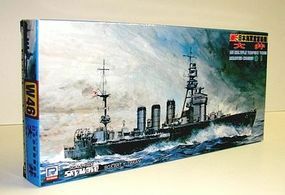 This is the 1/700 Scale Equipment Set for Japanese WWII Navy Ships (VIII) from Skywave Models. This is the 1/700 Scale Equipment Set for JMSDF Early Time Navy Ships Plastic Model Ship Accessory by Skywave Models. 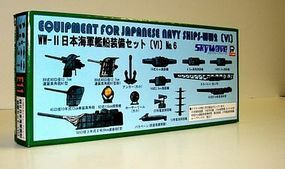 This is the 1/700 Scale Equipment Set for Japanese WWII Navy Ships (IV) (torpedo & mine launchers) from Skywave Models.